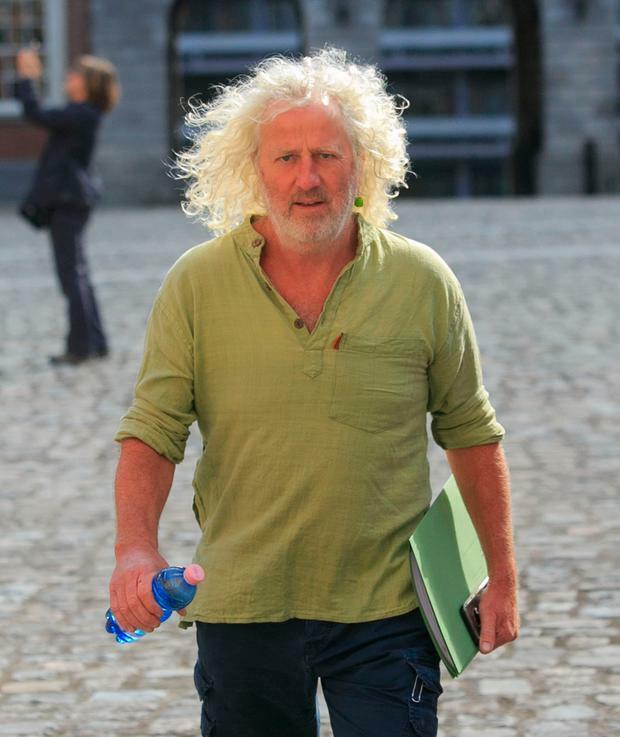 Independent TD Mick Wallace has said a former garda press officer was “crying” and “in a bad place mentally” on the night he told him he had been part of a smear campaign against whistleblower Maurice McCabe. Mr Wallace told the disclosures tribunal that while he believed the claim about the smear campaign, he felt Supt Taylor had been “economical with the truth” about his own position. Mr Wallace was giving evidence to the tribunal, which is investigating an alleged smear campaign by senior gardai against Sgt McCabe. Supt Taylor claims he negatively briefed journalists that Sgt McCabe had been investigated over a historic allegation of child sexual assault. He alleges he was ordered to do so in mid-2013 by then Garda Commissioner Martin Callinan and with the knowledge of then Deputy Commissioner Noirin O’Sullivan. They both deny his allegations. While Sgt McCabe was investigated over an allegation made by a woman known as Ms D, the DPP decided in 2007 there should be no charges and what was described in the complaint did not amount to a crime. Today, Mr Wallace said he came into contact with Sgt McCabe in 2012 and had met him many times since. He and Clare Daly met Sgt McCabe on October 3, 2016 and the “gist” of what he told them was that Supt Taylor was putting in a protected disclosure and had confirmed what Sgt McCabe would have felt all along, that there was a garda campaign to discredit him. Sgt McCabe had been excited about the fact that a senior member of the force was confirming what he suspected all along, Mr Wallace said. Mr Wallace said the first he heard of the allegation of sexual assault against Sgt McCabe was an anonymous phone call to his office. No journalist had come and told him about any smear campaign and he said his relationship with journalists would be generally “pretty poor,” he told Diarmaid McGuinness SC, for the tribunal. He said Supt Taylor told them there had been an “orchestrated” campaign to discredit Sgt McCabe and he understood at the time that Sgt McCabe was “motivated out of badness”. Mr Taylor had said that he felt the idea he got was that Maurice had not been well treated over the allegations that had been made against him and that this was “his effort to get back at them,” Mr Wallace said. “He was in contact with Commissioner Callinan at the time and when he would have a derogatory text or information he used to run it by Noirin to see what she’d think and a regular reply of hers would be a simple word of ‘perfect’,” Mr Wallace said of what Supt Taylor told them. Mr Wallace got the impression that texts were being sent around. After Supt Taylor gave evidence at the tribunal saying that texts were not sent out, Mr Wallace phoned him. He said Supt Taylor told him on that call that he “was keeping the commissioner informed about derogatory things” in the media about Sgt McCabe. This seemed like a change in position to Mr Wallace. Supt Taylor had spoken about “trumped up charges against him” and Mr Wallace said he now felt that Supt Taylor had been exaggerating or “misrepresenting” his own position. John Ferry BL, for Supt Taylor, put it to Mr Wallace that Supt Taylor has said texts were being used to inform his superiors about information in the media about Sgt McCabe and that he was not receiving or sending out texts of a derogatory nature. Mr Ferry said Sgt McCabe had given evidence that he believed there were derogatory texts received by Supt Taylor from superiors and distributed as part of the campaign. Supt Taylor denied this and Mr Ferry asked Mr Wallace if it was possible he was mistaken in his impression of what was said. “It’s clear that (Supt Taylor) couldn’t have told the truth in his living room and in here as far as I’m concerned,” he said. “He cried a few times that night,” he said. Mr Wallace said he believed what Supt Taylor had told him about Sgt McCabe but he was “economical with the truth” about aspects of his own position. Mr Wallace was then cross-examined by Conor Dignam, for the gardai, Mr Callinan and Ms O’Sullivan. Mr Wallace repeated that he could not be 100pc sure that Supt Taylor said he sent texts out but that was the impression he got. Supt Taylor had now accepted there was a valid and proper investigation, Mr Dignam said. Patrick Marrinan SC, for the tribunal, asked if she recalled Sgt McCabe telling her about text messages being sent out by Supt Taylor to the media. Her memory was that Sgt McCabe had understood from speaking to Supt Taylor that he had evidence of that activity. Ms Daly said she saw the call very much as part of a campaign she had been aware of since 2011, there had been a “wholesale” attempt to undermine and isolate Sgt McCabe. Ms Daly said she and Mr Wallace went to Mr Taylor’s home with a view to verifying the information that Sgt McCabe had given them. “Leaving the meeting, I was very clear that Dave Taylor had confirmed the information that Maurice had given us,” she said. She said Supt Taylor told them his job was to “tip off journalists to look into the background of Maurice McCabe”, that he was not co-operating and was driven by agendas. It struck her that Supt Taylor was remorseful for his role, which was to “tip off journalists and anybody else who would listen” that Sgt McCabe was not to be trusted. From her notes, she said it was clear that they discussed phones a lot, Supt Taylor introduced the idea of phones being “bleached” and that was in the context that phones could verify that there had been a campaign. She could not 100pc say that Supt Taylor said he sent out texts negatively briefing journalists. Ms Daly agreed that she mentioned texts on a radio interview and nobody sought to correct this. In cross examination, she told Supt Taylor’s lawyer she was “not obsessed” about text messages and the focus of the meeting for her was to verify what Sgt McCabe said. She said what they were told “wasn’t anything knew” but verified what they already knew. Supt Taylor now accepted that the investigation was legitimate and admitted much of the wrongdoing for which he was investigated, Mr Dignam said. Earlier, Garda Human Resources Director John Barrett was cross examined. He had told the tribunal last week he was not the “impeccable authority” who Sgt McCabe claims told him that RTE’s May 2016 broadcasts about the O’Higgins Commission report were “planned and orchestrated” by Ms O’Sullivan. Sgt McCabe has claimed that at a meeting in his home in 2016, Mr Barrett told him that information behind RTÉ broadcasts “would have come from block one.” Sgt McCabe said he took this to be a reference to Ms O’Sullivan’s office. “I have no recollection of ever saying that,” Mr Barrett told Michael McDowell SC, for Sgt McCabe. He said it was “not correct” and that was neither in his recollection, the minutes he took or his statement. Despite Mr Barrett’s denial, Sgt McCabe has said not withdrawing his complaint, the tribunal heard previously. Niamh O’Connor, an RTE documentary programmes commissioning editor, said that journalist Philip Boucher Hayes had spoken to Mr Callinan, then garda commissioner, privately before a Crime Call programme on December 2013. In cross-examination, she told Micheal O’Higgins SC, for the gardai and Mr Callinan, that she had spoken to Mr Boucher Hayes after he gave evidence to the tribunal earlier this month. She had also read the transcript of his evidence. Mr O’Higgins asked if Mr Boucher Hayes had reminded her that she spoke to him some time after the programme. “I didn’t need to be reminded,” she said. She accepted that both Mr Boucher Hayes and co-host Grainne Seoige had been “a little angry” at the position being adopted by the gardai for the programme. Tom Donnelly, Drive Time series producer said when he spoke to Mr Boucher Hayes after the Crime Call programme, they were primarily concerned about the editorial aspects of the interview. Mr Boucher Hayes said “you might not believe this but..” and told him about the conversation he had had with Mr Callinan. Mr Callinan had said that if he wanted any more information, “he could talk to a colleague,” Mr Boucher Hayes had told Mr Donnelly. Mr Boucher Hayes said Mr Callinan had gestured or pointed to a garda press office colleague down the corridor. “I believe that to be Supt Dave Taylor from the Garda Press Office,” Mr Donnelly said. He did not recall Mr Boucher Hayes specifically naming Supt Taylor. He told Mr O’Higgins he spoke to Mr Boucher Hayes after he gave evidence to the tribunal and read the transcript. “I think he was surprised that a senior garda figure would say something like this to him,” Mr Donnelly said. He did not agree that his reading of the transcript and conversation with Mr Boucher Hayes may have “infused” details in his mind. The “worst things” was “a phrase that sticks in one’s head,” he said. Later, it emerged that Supt Taylor is now naming a 12th journalist as being among those he negatively briefed. Cathal McMahon, former crime reporter with the Irish Daily Mirror said he learned from a non-garda source in early 2014 that Sgt McCabe had been investigated for a historic allegation of sexual assault. He said he contacted Supt Taylor who confirmed the story and suggested to him that he go to Cavan. Mr McMahon had “serious concerns about the veracity of the story” and brought it to his editor, John Kierans, who told him he did not feel it was worth pursuing. Mr McMahon said he was satisfied with that and no story was run. “It alarms me when a the garda press office are confirming a story against an existing member of their own force,” he said. Mr Kierans said he had suspected Mr McMahon’s original source was Supt Taylor but he accepted Mr McMahon’s evidence that it was not. Cross-examined by Micheal O’Higgins SC, for the gardai, Mr Kierans said he was never negatively briefed by Supt Taylor. He said this story was given to “certainly two to three” other newsrooms. Tribunal chairman, Mr Justice Peter Charleton, said anybody else who had information had a duty to come forward. Mr Justice Charleton asked John Ferry BL, for Supt Taylor, to get instructions on issues raised in Mr McMahon and Mr Kieran’s evidence, from his client, who was out of the country. They were both then recalled. Mr Ferry put it to Mr McMahon that he was one of the journalists who was negatively briefed about Sgt McCabe. He said Supt Taylor would have taken the opportunity to “drop it into conversations” with Mr McMahon. Supt Taylor said he never directed Mr McMahon to Cavan. Mr McMahon said this was not his recollection. Mr Ferry then put it to Mr Kierans that Supt Taylor denied he directly briefed any newsrooms or editors, but only journalists. Mr Kierans said he did not know how it was done, his understanding was just that it was “peddled around town.” He was not prepared to identify any sources in the business. Retired Detective Superintendent John McCann said he did not pass a “rumour” he heard about Sgt McCabe on to his daughter, Irish Daily Mail crime correspondent Debbie McCann. Mr McCann, who had been attached to the garda domestic violence and sexual assault unit, said he never heard about the allegation against Sgt McCabe while he was on the force. He heard a “rumour” shortly after his retirement but denied that he passed it on to his daughter. He said he knew no detail about it and no facts around it and did not relay it to his daughter. Mr McGuinness, for the tribunal, said Ms McCann had been perhaps the first journalist to go to Ms D’s house and asked if it was a coincidence that the information he had could have led her there.